Verne & Ellsworth Hann is a heating, cooling and plumbing company located in Cleveland Heights. Our services require us to go to customer’s homes to quote, service or install equipment. GPS capability has made finding a customer’s house much easier than a traditional paper map but it’s still necessary for an address to be visible. Our owners and technicians always appreciate a clear house number. Script numbers or numbers that are spelled out in words may be aesthetically pleasing but are difficult to read quickly from the street. 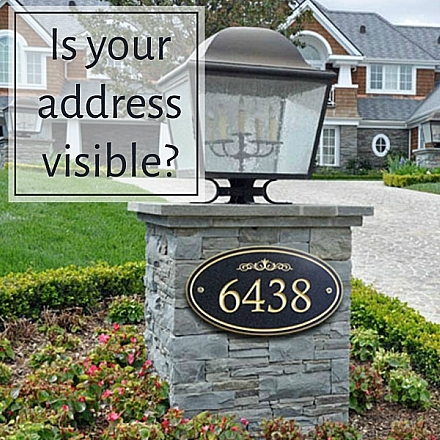 If the house is located more than 45 feet from the street, the numbers should be displayed on a fence, mailbox, or other appropriate place. Be sure the numbers are not obstructed by shrubs, trees, or decorations, such as flags. Whether it’s emergency service, the pizza guy or Verne & Ellsworth Hann, please take a moment to evaluate whether your house number is visible. Verne & Ellsworth Hann has been servicing Northeast Ohio for over 63 years. Although we are extremely familiar with Cleveland Heights and the surrounding area, it’s essential that we can easily find our customers homes. Owned and operated by Bill and Chris Hann, Verne & Ellsworth Hann is a 5-generation company and the ONLY Hann family owned HVAC company in Cleveland.